Can you tell from the lack of postings that I have been busy? 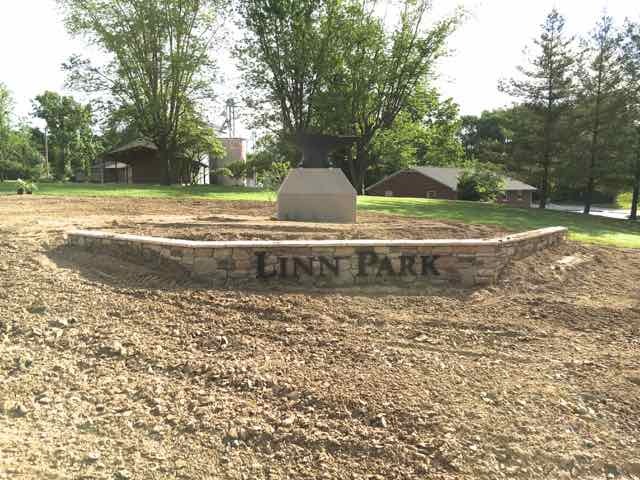 We are trying to get the Linn Park Anvil Garden completed by this weekend since we expect lots of people to be in town for the Heritage Days Festival and the Martinsville Ag Fair which follows next week. It has rained so much here this spring-- fortunately not like in Texas with flooding, but lots of mud!! We needed several loads of topsoil to be brought in and smoothed out for the Anvil Garden. Joe Esker volunteered to do the excavating several months ago but then with the rain and his job he couldn't get to it until a couple of weeks ago. As he was working on the area a large rain came forcing him to quit. He hoped he had it done enough that we could work with it, but it was obvious after the rain that we needed a couple more loads of dirt. I finally discovered a local man who was happy to work on it for us. He smoothed it and tilled it and got it ready for us to plant, so a friend and I spent all of Friday and part of Saturday accummulating plants, huge rocks, stepping stones and grass seed. Here is the area ready to be planted. We scheduled a volunteer workday for tomorrow to get all the Linn Park gardens in shape and to plant the new one, but then yesterday came another inch of rain! The rocks are being delivered tomorrow at 7:30 but it's too muddy to set them or the stepping stones, or to plant so of course, we can't mulch the area. It is so frustrating when there is so little time! I'm sure it will all work out, but in the meantime I'm feeling a little stressed with the Festival starting on Friday and our committee working to get ready. It's always good to have deadlines, isn't it? I get much done in a very short time if need be. I just hope I'm not so tired I can't enjoy the Festival and our out of town guests who are coming to stay with us, because I've been looking forward to this for a long time.